For an end-of-the-year writing assignment with a fun follow-up, try this persuasive writing activity. Tell the class that it’s time to review some vocabulary from this year, but that you can’t decide which type of review game to play – hangman (or whatever less-violent name you use for this favorite game) or an old-fashioned spelling bee. Tell the kids that they will vote later, but that for right now, you need to see who is leaning toward which game. After the kids raise their hand for their favorite, divide the class into small groups with each group composed of either all hangman kids or all spelling bee kids. 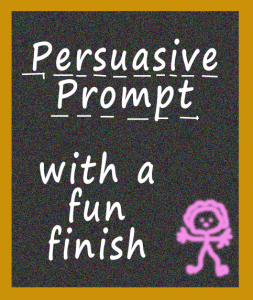 Have each group write a short persuasive piece in support of the game of their choice,telling why it will be both fun and educational. Tell them that there is no minimum length, but that they will be presenting it to the class and that it shouldn’t take more than one minute to present. Have each group choose a representative to present their writing to the class. Take a final vote by secret ballot. The secret ballot is important so that kids will feel free to change from their original vote if they want to. Play a whole-class game of either hangman or spelling, whichever game won the vote. If you don’t want to use hangman or a spelling bee, you can substitute other games of your choice. For the list of words for the games, you might want to use important English terms such as story element words, parts of speech, and writing terminology or you could use vocabulary lists from stories that the kids have read during the year. Whatever you choose, the kids will have a fun time competing, not just in the games, but also for the votes!